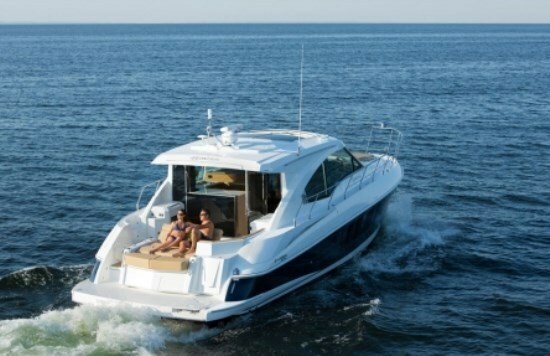 The new 45 Cantius is one of ten models of Cruisers Yachts for 2013 ranging from thirty-one to fifty-four feet, and new for this year, Cruisers Yachts has added a brand new ten-model Cruisers Sport Series to its lineup which brings its total model offerings to twenty ranging from twenty-two feet through to its flagship 540 SC. 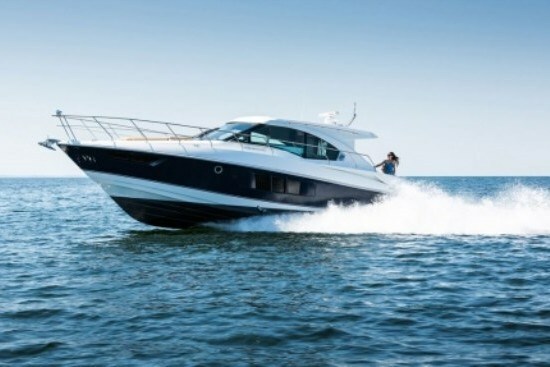 Now you can shop Cruisers Yachts for bowriders, deck boats, cuddy cabins and mid-cabins as well as its range of express cruisers, motoryachts, and sedans. One small step up from the cockpit and through a starboard side polished stainless steel framed glass door gets you into the bright, open salon. 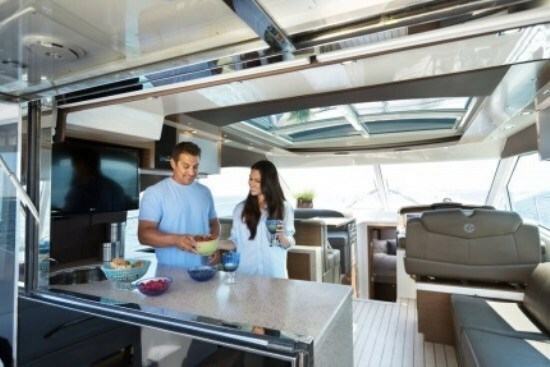 Immediately to port is an L-shaped galley and above the aft portion of the galley counter is a huge, hinged, swing-up polished stainless steel framed window that, when open, and when the entry door is open, opens up the entire salon to the cockpit for fresh air and conversation. With the galley located in this aft portion of the salon, meal, snacks, or refreshment preparation is conveniently accomplished in the centre of the entertainment area between the salon and cockpit seating areas. The galley comes standard with synthetic wood flooring, combination microwave/convection oven, 2-burner electric stove, refrigerator/freezer, slide out drawer-type liquor cabinet, and a 32” flatscreen TV/DVD. The salon stereo is a satellite adaptable AM/FM/CD/MP3/iPod® with two speakers and helm remote. Opposite the galley on the starboard side is a double sofa. Forward of this is the raised helm station featuring a double-wide fore and aft adjustable helm seat. Opposite to starboard is a family sized U-shaped dinette. In the fiberglass hardtop above this area is an electric sliding sunroof plus skylights. The straightforward layout of the helm features Fly-by-Wire electronic steering and Joystick control of your choice of twin Volvo diesel IPS 500 (375 hp) or 600 (435 hp) engines. Volvo digital diesel instrumentation and diagnostics comes with the package. Lots of room is provided for two large screen navigation displays. Windscreen defoggers are standard as is a 40,000 BTU air conditioning/heating system, 13 kW diesel generator, anchor & windlass, trim tabs, and a Glendinning power actuated shore power cord release and retractor. 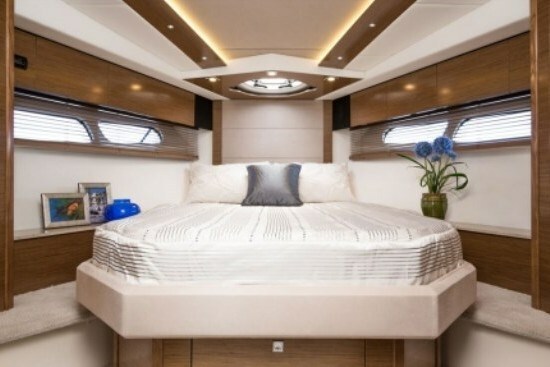 Centred between the helm and the dinette, a companionway leads down a few steps and forward through a privacy door to the master stateroom with its own private head. As Cruisers Yachts says, “Inner spring mattresses are out. All of our mattresses are now constructed from high density memory foam - the same kind of material utilized for the popular Tempur-Pedic Mattresses advertised on television.” This relates to the centred raised queen berth in the master. In here are two cedar lined closets, indirect lighting and lots of storage plus almost full length hullside windows for natural lighting. The starboard side private master head offers 6’4” headroom in the separate glass-doored shower stall, centrifuge toilet, and “euro-styled” fixtures.